Well, it looks like my exuberance was premature. I was able to find some additional information on the Internet which lists this bridge as being of fairly modern construction. Dale. J. Travis operates a website devoted to round barns and covered bridges, both fascinating structures. He has a comprehensive listing from across the US, not just of historic structures but of modern construction as well. 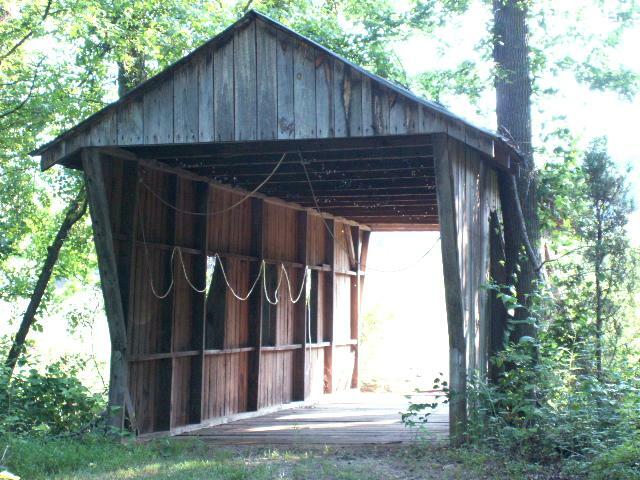 Travis lists thirteen bridges for South Carolina, including Campbell’s and this one on Mayfield Road. Most of these are decorative, and are found on golf courses and gardens. According to Travis’ information, the Mayfield Bridge was built in 1991 and is about 25 feet in length. I’m guessing that it hasn’t been kept up since that time, so the tin roof has rusted, making it look older than it is.